Charge Shot!!! : I'm Getting Awful Sick of These "Personal Appeals"
I'm Getting Awful Sick of These "Personal Appeals"
Have you visited Wikipedia lately? Chances are, if you're a college student searching for infallible information to cite on your term paper, a concerned citizen looking to beef up on world news, or just a curious American interested in reading up on Frank Zappa's favorite rock guitarist, your answer to my first question is a resounding "Yes!" And if you answered "Yes!" to the above question, you're sure to have noticed a rather unsightly and intrusive banner link across the top of ANY Wikipedia page you might have visited. It's a link to an impassioned plea from some anonymous dude to donate money to his crackpot enterprise. Nobody wants to kick off the discussion by raising his/her hand? Alright, I'll start. Imagine the World Wide Web as we know it today. Hundreds of millions (billions? trillions?) of websites at your fingertips, just waiting to be clicked on. Each website opens up a one-of-a-kind link to information or opinions or services not to be found anywhere else in the world. Now imagine the largest link on each one of these websites led to a request for the viewer to transfer funds directly into the checking account of the purveyor of each website. Thankfully, that's not the case. It is, however, the case for one of the most ubiquitous "free" sites on the internet: Wikipedia. When you go to any article on Wikipedia, an "ad" pops up at the top of each page offering a few well-thought-out reasons to donate one's hard earned cash to the supposed "free encyclopedia" and a mechanism by which to do so (see right). Each ad features the entrepreneurial mug of Wikipedia founder Jimbo Wales. Hell, his ad even appears above his own Wikipedia entry. 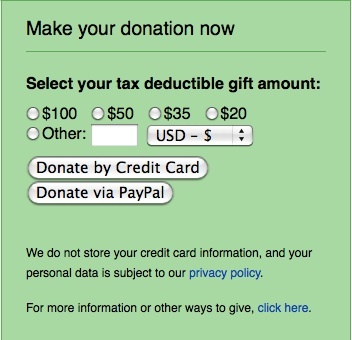 There's even a Wikipedia entry describing the various ways to donate to Wikipedia. What has the free encyclopedia become? Don't get me wrong, Wikipedia is a glorious entity. Anyone can add to it. Anyone can edit it. Anyone can take up a false sense of authority and attempt to police it. But apparently, only one person is allowed to ask its users for money. Wikipedia has made a mark on society. Any reputable teacher/professor now has to begin any class with a speech about how information found on Wikipedia is not necessarily accurate, despite the cultural aplomb attained by the site, and despite how seriously the site's administrators take themselves. Some might think its editability as a selling point, others might consider it a black mark against the site. In asking its users for money directly, Wikipedia has put itself in some pretty distinguished company: the church with its collection plate, the government with its bureau of internal revenue, PBS with its incessant pledge drives. And we all know what happens to these erstwhile beneficial institutions once they start trying to take for themselves what belongs to Caesar. The 501(c)(3) status can only disguise so much greed before it becomes just a failed cover-up.